I recently watched Agora, the movie about Hypatia, a female mathematician, philosopher and astronomer in late 4th century Roman Egypt. In the film Hypatia struggles to save the Great Library of Alexandria from destruction and is finally murdered by Christian bigots. The film suggests what Stephen Greenblatt clearly states in his book, The Swerve: How the World Became Modern, that the murder of Hypatia “effectively marked the downfall of Alexandrian intellectual life” and so paved the way for the Dark Ages. Both the film and the book are clear examples of what Herbert Butterfield called the Whig Interpretation of History, “studying the past for the sake of the present” as opposed to “trying to understand the past for the sake of the past”. At the core of this interpretation is the view that what we have now is rational, democratic and wise and consequently, anything that moved us towards this point was a good thing and anything that hindered this progress was a bad thing. What was ‘good’ was freedom and science and what was ‘bad’ was religion and superstition. Consequently it was a good thing that the Greeks and Romans invented science and reason, a bad thing when the Roman Empire collapsed leading to the Dark Ages, when people became poor, dirty and ignorant, and a good thing that the Renaissance occurred leading to a rediscovery of reason and the inventions of the Greeks and Romans. However, virtually everything about this view is false starting with the very idea of progress. The ancient Egyptians and the ancient Greeks had no concept of progress because history for them was cyclical. It was Christianity which created the expectation of a radical alteration in human affairs through the idea of history as a story of redemption and salvation. In this way Christianity gifted the concept of progress to the modern world. Today modern secularists snigger at talk about religious salvation but they themselves adhere to the view that salvation is only possible through science and technology, failing to realize that this is also just another myth providing them with the illusion of significance. As always; great post! I would only respectfully suggest that science arose in other parts in the world (China comes to mind instantly) as well as in Europe, even if in somewhat different fashion. Thank you Daniela. China certainly possessed skills, crafts, technologies, engineering, learning etc. However, without testable theories their observations remained just facts rather than science. Real science arose only once in Europe. China, Islam, India, and ancient Greece and Rome each developed alchemy but only in Europe did alchemy develop into chemistry. 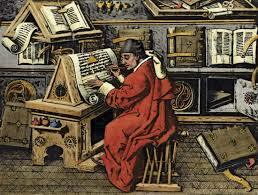 Many societies developed elaborate systems of astrology but only in Europe did astrology lead to astronomy. “..faith in the possibility…theology” I appreciate the wisdom you bring to your post, Malcolm. Thank you Bonnie. I’m glad you enjoyed the post. I bought the book, “Swerve” but now maybe regret it? I’ve never understood why people separate Christianity/religion from science. The word “created” in the book of Genesis translates in Hebrew as, “organized”. It’s my personal belief that God Organized the universe using the very laws of math and science that He created. He is the master scientist, if you will- bound by His own laws. It makes total sense to me that Christianity would be the foundation for scientific progress. And yes, God is responsible for endowing us with logic and reason – divine gifts that we share with our maker. Lisa, you should definitely read ‘The Swerve’ as there is so much more in it. Just realize that Greenblatt is a very good story teller but not a very good historian. Another very deep post. What did you get your degree in? Clay, thank you but as Mark Twain said, “I have never let my schooling interfere with my education”. I just love your third and fourth paragraphs. I’m relearning history – and going through this time period – with my 6-yr-old. You and I could talk all day. =) You bring to mind an old post of mine, thoughts on what makes us human (a response to an incredibly well-written piece written in solitary confinement, as it is entirely inhumane in there). When change propels us forward, it is one for the better – to higher consciousness and goals, a broader base of knowledge and achievement. I think of my husband who is ever pushing the frontiers of his own learning…while setting fresh goals for his son. Were we instead to devolve, we wouldn’t be living our human potential. One of the most tragic sights is the rich, talented, and beautiful executing their own ruin, squandering faculty and resources on addictions. When, on perfectly good legs, they turn and walk away from the horizon of promise. It is pitiful because this forward movement is a capacity especial to man, as the sweep of history shows. Mineral, plant, animal remain their characteristic matter and energy over time. But giraffes over two thousand years ago did not learn to build fire or revamp their lifestyle by the industrial revolution. Human energy can carry a powerfully constructive, creative momentum. Even if you don’t believe we bear the image of God in a way plants and animals do not, you have to listen to what our communicative capacity says about personhood. We certainly can talk to ourself, but communication is at its most meaningful when it happens in a social context, with someone who gives us audience. The fact that we can speak is its own witness that we are born into a world where we can expect others to tune into us. Now, while animals have a language, our innate need to express takes us more deeply and richly into articulation of complex structure and substance and medium. Not only speech, but also art, allow us to mark our personal identity and broad humanness. I express myself through the writing and my music. Others paint, dance. God is known as the Living Word by which He spoke all things into life. We bear this divine image in the ways we speak our verbal, visual, physical art. In the artistic procreation, we do more than transmit energy, breathe, even learn. We birth something of beauty. So glad to have met, Malcolm. Rich blog you have here. Diana, so glad to have met you too! Your writing has a wonderful lyrical quality to it, not to mention the essential humanity at the core of your posts. I’m afraid that I’m one of those who “don’t believe we bear the image of God”. Without a religious foundation there is no hierarchy of value in the animal kingdom with humans at the top, there are simply animals with diverse needs. Malcolm, you got me: I am chuckling away, thoroughly impressed by the persistence and curiosity (and heart — and ability) that dug up the solitary confinemt piece. Our coffee hour would end up a long one. =) Hmm….we pursue and create art, beauty…and we are just animals. Wow. I’d have trouble living out that one. But that is the richness of what we have going on the blogs, voices across the range both consonant and discordant. Thanks so much for the follow. Talk again. “I believe in Christianity as I believe that the sun has risen: not only because I see it, but because by it I see everything else.” My dear CS Lewis. Any (intelligent) reader (at that) who digs his way into my work to read more surely has earned my follow. I also imagine you’ve done your share of fighting – in your successful career and the cancer. I appreciate that as one who finds herself leaning into constant wind. I will not be able to comment as I’d always like to in the coming month. I gave myself Carpal T after pouring days into the MMA post and need to hop off soon. But keep up I shall. Thank you. We all have to find our own path and I certainly respect yours. Best wishes for a speedy recovery on the Carpal T. Also, good luck with the home-schooling which we did for two years. Goodness, you’ve given of your time…but if you can manage this one, your post brought this one to mind as well. Thank you. This is another wonderful post. I wonder what you think of Camille Paglia and in particular her latest book, Glittering Images: A Journey Through Art from Egypt to Star Wars? Here comes humanism, and with it, I suspect, more emphasis on ‘democracy’ & ‘pure democracy’ and less on the Constitutional Republic part of our traditions in the public mind, whatever your views on Christianity. One of the problems with both the Greenblatt book and some of its critics is a promiscuous use of the term Dark Ages to lump together a span of over 1000 years, from the fall of the Roman Empire during the 4th and 5th centuries CE until the Renaissance in the 15th Century, or sometimes until even later. Serious historians make less crude distinctions. They usually confine the term Dark Ages to Europe during the half millennium after the fall of Rome, when conditions were pretty much dreadful and large sections of Europe was still pagan but being converted to Christianity. Beginning in the 11th century you have a commercial revolution centered in the Italian city states, economically connecting Europe to the much more advanced Islamic and Chinese parts of the world. It culminated in what is called the High Middle Ages of the 13th Century, when living conditions in Europe had improved considerably. Then you have the disastrous 14th Century, where the combination of start of the Little Ice Age (and its accompanying crop failures and famines), the Black Death (a micro-parasite), and the rise of territorial States and their warfare (macro-parasites) causing significant retrogression. The Renaissance represents the beginning of a return to European recovery. Jeff, thank you for this perceptive comment. The term Dark Ages used to refer to the entire period of the Middles Ages but the period has undergone a revisionist makeover as a result of the increased recognition of the accomplishments of the Middle Ages. Consequently, you are correct to point out that most historians either use the term to refer to the early Middle Ages or have discarded the term completely. However, despite the title, the post was really about the neglected role of Christianity in the development of freedom, science and capitalism. You might recall Jared Diamond’s question at the beginning of Guns, Germs and Steel as to why people in the West have the “stuff”. In the post I am suggesting that the answer is Christianity. I understand that the expression “Dark Ages” is only used by English language historians. Continental European historians do not use this phrase to describe the early period of the Middle Ages, between the time of the fall of Rome and the appearance of vernacular written documents. Mark, thank you for this interesting observation. I wonder why the division? Very interesting and thought provoking, thanks for writing this, and thanks for links to interesting books as well. I’d never considered this way of looking at history – thank you! Some thought provoking ideas. I’ve been reading a lot of Medieval and classical literature lately for classes, and it’s been fascinating. Also, I’m fascinated by the way later writers draw from the deep well of these insights and traditions. Brett, thank you. This should not be too surprising as philosophy deals with recurring dilemmas. For example, we increase our knowledge of technology and science but not of ethics and politics. Well put. Thank you for the post. And, I greatly appreciate everyone’s contributions and discussions in the comments. Mike, my pleasure. I’m glad you enjoyed it. Once again, you have me thinking, Malcolm. Christianity beating the classicists to scientific discovery? Because they saw history as a line and not a cycle? Intriguing. Yes, but more particularly because, according to Christianity, God created the world according to immutable principles that could be discovered if we only searched for them using our God-given power of reason. From today on, I’ll see to it that I read your posts regularly. I can feel my brain work as I read this article. Thank you, Malcolm!